According to common lore, massive elementary higher spin particles lead to inconsistencies when coupled to gravity. However, this scenario was not completely ruled out by previous arguments. In this paper, we show that in a theory where the low energy dynamics of the gravitons are governed by the Einstein-Hilbert action, any finite number of massive elementary particles with spin more than two cannot interact with gravitons, even classically, in a way that preserves causality. This is achieved in flat spacetime by studying eikonal scattering of higher spin particles in more than three spacetime dimensions. Our argument is insensitive to the physics above the effective cut-off scale and closes certain loopholes in previous arguments. Furthermore, it applies to higher spin particles even if they do not contribute to tree-level graviton scattering as a consequence of being charged under a global symmetry such as ℤ2. We derive analogous bounds in anti-de Sitter space-time from analyticity properties of correlators of the dual CFT in the Regge limit. We also argue that an infinite tower of fine-tuned higher spin particles can still be consistent with causality. However, they necessarily affect the dynamics of gravitons at an energy scale comparable to the mass of the lightest higher spin particle. Finally, we apply the bound in de Sitter to impose restrictions on the structure of three-point functions in the squeezed limit of the scalar curvature perturbation produced during inflation. M. Porrati, Universal limits on massless high-spin particles, Phys. Rev. D 78 (2008) 065016 [arXiv:0804.4672] [INSPIRE]. N. Arkani-Hamed, T.-C. Huang and Y.-t. Huang, Scattering amplitudes for all masses and spins, arXiv:1709.04891 [INSPIRE]. S. Ferrara, M. Porrati and V.L. Telegdi, g = 2 as the natural value of the tree-level gyromagnetic ratio of elementary particles, Phys. Rev. D 46 (1992) 3529 [INSPIRE]. M. Porrati, Massive spin 5/2 fields coupled to gravity: tree level unitarity versus the equivalence principle, Phys. Lett. B 304 (1993) 77 [gr-qc/9301012] [INSPIRE]. A. Cucchieri, M. Porrati and S. Deser, Tree level unitarity constraints on the gravitational couplings of higher spin massive fields, Phys. Rev. D 51 (1995) 4543 [hep-th/9408073] [INSPIRE]. X. Bekaert, S. Cnockaert, C. Iazeolla and M.A. Vasiliev, Nonlinear higher spin theories in various dimensions, in Higher spin gauge theories: Proceedings, 1st Solvay Workshop: Brussels, Belgium, 12-14 May, 2004, pp. 132-197, 2004, hep-th/0503128 [INSPIRE]. M.T. Grisaru, H.N. Pendleton and P. van Nieuwenhuizen, Supergravity and the S matrix, Phys. Rev. D 15 (1977) 996 [INSPIRE]. C. Aragone and H. La Roche, Massless second order tetradic spin 3 fields and higher helicity bosons, Nuovo Cim. A 72 (1982) 149 [INSPIRE]. R.R. Metsaev, Cubic interaction vertices of massive and massless higher spin fields, Nucl. Phys. B 759 (2006) 147 [hep-th/0512342] [INSPIRE]. L. Cornalba, M.S. Costa, J. Penedones and R. Schiappa, Eikonal approximation in AdS/CFT: conformal partial waves and finite N four-point functions, Nucl. Phys. B 767 (2007) 327 [hep-th/0611123] [INSPIRE]. J. Maldacena and A. Zhiboedov, Constraining conformal field theories with a higher spin symmetry, J. Phys. A 46 (2013) 214011 [arXiv:1112.1016] [INSPIRE]. N. Boulanger, D. Ponomarev, E.D. Skvortsov and M. Taronna, On the uniqueness of higher-spin symmetries in AdS and CFT, Int. J. Mod. Phys. A 28 (2013) 1350162 [arXiv:1305.5180] [INSPIRE]. V. Alba and K. Diab, Constraining conformal field theories with a higher spin symmetry in d<3 dimensions, JHEP 03 (2016) 044 [arXiv:1510.02535] [INSPIRE]. K. Hinterbichler, A. Joyce and R.A. Rosen, Eikonal scattering and asymptotic superluminality of massless higher spin fields, Phys. Rev. D 97 (2018) 125019 [arXiv:1712.10021] [INSPIRE]. X.O. Camanho, G. Lucena Gómez and R. Rahman, Causality constraints on massive gravity, Phys. Rev. D 96 (2017) 084007 [arXiv:1610.02033] [INSPIRE]. J.D. Edelstein et al., Causality in 3D massive gravity theories, Phys. Rev. D 95 (2017) 104016 [arXiv:1602.03376] [INSPIRE]. G. ’t Hooft, Graviton dominance in ultrahigh-energy scattering, Phys. Lett. B 198 (1987) 61 [INSPIRE]. S. Gao and R.M. Wald, Theorems on gravitational time delay and related issues, Class. Quant. Grav. 17 (2000) 4999 [gr-qc/0007021] [INSPIRE]. G. Tiktopoulos and S.B. Treiman, Relativistic eikonal approximation, Phys. Rev. D 3 (1971) 1037 [INSPIRE]. D.N. Kabat, Validity of the Eikonal approximation, Comments Nucl. Part. Phys. 20 (1992) 325 [hep-th/9204103] [INSPIRE]. Yu. M. Zinoviev, On massive high spin particles in AdS, hep-th/0108192 [INSPIRE]. J. Bonifacio and K. Hinterbichler, Universal bound on the strong coupling scale of a gravitationally coupled massive spin-2 particle, Phys. Rev. D 98 (2018) 085006 [arXiv:1806.10607] [INSPIRE]. S. Ferrara, A.F. Grillo, G. Parisi and R. Gatto, The shadow operator formalism for conformal algebra. Vacuum expectation values and operator products, Lett. Nuovo Cim. 4S2 (1972) 115 [INSPIRE]. F.A. Dolan and H. Osborn, Conformal four point functions and the operator product expansion, Nucl. Phys. B 599 (2001) 459 [hep-th/0011040] [INSPIRE]. 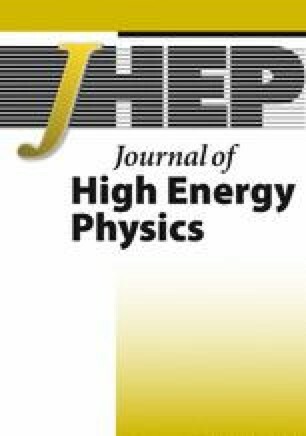 D. Amati, M. Ciafaloni and G. Veneziano, Effective action and all order gravitational eikonal at Planckian energies, Nucl. Phys. B 403 (1993) 707 [INSPIRE]. D. Amati, M. Ciafaloni and G. Veneziano, Planckian scattering beyond the semiclassical approximation, Phys. Lett. B 289 (1992) 87 [INSPIRE]. D. Amati, M. Ciafaloni and G. Veneziano, Can space-time be probed below the string size?, Phys. Lett. B 216 (1989) 41 [INSPIRE]. D. Amati, M. Ciafaloni and G. Veneziano, Classical and quantum gravity effects from planckian energy superstring collisions, Int. J. Mod. Phys. A 3 (1988) 1615 [INSPIRE]. D. Amati, M. Ciafaloni and G. Veneziano, Superstring collisions at planckian energies, Phys. Lett. B 197 (1987) 81 [INSPIRE]. M. Taronna, Higher spins and string interactions, arXiv:1005.3061 [INSPIRE]. A. Sagnotti and M. Taronna, String lessons for higher-spin interactions, Nucl. Phys. B 842 (2011) 299 [arXiv:1006.5242] [INSPIRE]. A. Higuchi, Forbidden mass range for spin-2 field theory in de Sitter space-time, Nucl. Phys. B 282 (1987) 397 [INSPIRE]. S. Deser and A. Waldron, Partial masslessness of higher spins in (A)dS, Nucl. Phys. B 607 (2001) 577 [hep-th/0103198] [INSPIRE]. D. Baumann, Primordial cosmology, PoS(TASI2017)009 [arXiv:1807.03098] [INSPIRE]. 2.Department of Physics and AstronomyJohns Hopkins UniversityBaltimoreU.S.A.